According to all of the excited emails I’ve been getting, Blind Descent is shipping in the next few days! We were in a local Barnes and Noble (Issaquah) yesterday and the manager said they had a shipment coming in this Thursday. It’s pretty cool to experience the day in the life of authoring a book. It’s a long process with many moving parts but I’m so grateful for everyone involved. It also reminds me of how blessed I am to be here after my situation on Everest 3 years ago, especially in leu of the recent tragedy in the Khumbu Icefall. The next few weeks will be interesting as I travel to New York for a book tour. I’ll be on CNN’s AC360 on Tuesday 5/6. Tyndale PR has others lined up so JoAnna and I’ll go with an open schedule and be prepared to go where needed . I’m a planner so I like to know what’s going on but things don’t work that way in this new arena. 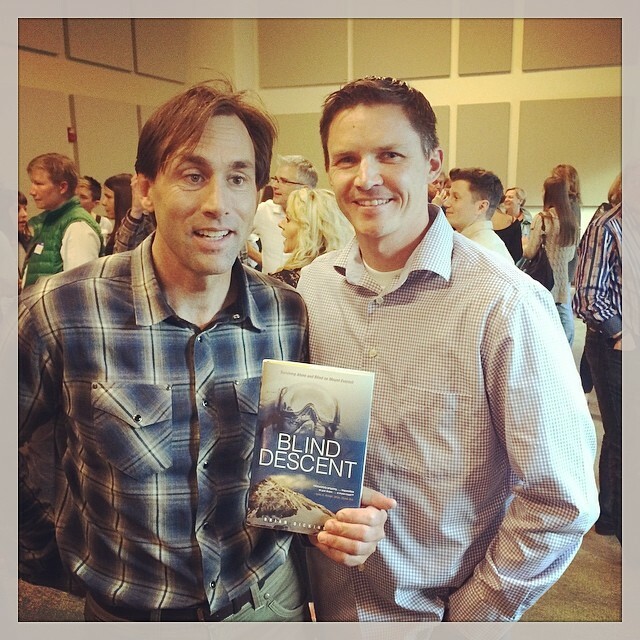 This past Friday I met with Erik Weihenmayer (blind adventurer) who was in Seattle giving a No Barriers presentation to the Mountaineers. Erik is so amazing and has done more for others than anyone I know. It’s such a pleasure to know him and to have him endorse Blind Descent. I wanted to personalize it in braille but didn’t have time since I just got the books, but it was cool to watch him read the front cover with his fingers. I’ll try to keep everyone updated with future talks and book signings. Friday 5/9 I’ll be signing books at the TPC Snoqualmie for the Summit Classical Christian School auction. 50% of proceeds will go toward the school. Last year I was honored to be their keynote speaker. There’s still room to sign up if you’re interested in attending. The venue is as beautiful as they come and the auction items are going for a great cause. For Father’s Day this year I’ll be presenting at Church on the Ridge (Snoqualmie, Wa). I spoke their 3 years ago after returning from Everest. I’ll be signing books there as well, so plan to be there with your Dad!